Research Challenge 1 concerns the synthesis and characterization of skyrmionic materials. Polycrystalline powder and single-crystals of skyrmion materials will be produced using a range of techniques. In the study of skyrmion lattices, one class of materials has occupied a prominent place in the literature: crystals that adopt the P213 space group (or B20 phase). The first systems identified were a group of transition metal compounds, all of which lack space-inversion symmetry and host the Dzyaloshinskii-Moriya (DM) interaction. Examples of this class are FeGe/Si, Fe1-xCoxSi and MnSi. An interesting example of the B20 type materials that is not metallic is the magneto-electric Cu2OSeO3, also exhibiting helimagnetic order. It has a much more complex unit cell, with the Cu building blocks of which offer opportunities to tune the structure-property relationship observed in the variety of B20 structures. Our programme of materials preparation activity will grow from preparation of targeted examples of B20 materials. However, besides the B20 structure types, there are other related structures that lend themselves to the search and study of skyrmion lattices such as βMn structure types. The search for new materials that may exhibit skyrmion lattices will form one of the themes of the materials research in the programme. We intend to search for compounds that exhibit chiral/helical magnetic ordering or alternatively, a ferromagnetic phase that can be switched to a helimagnetic phase. 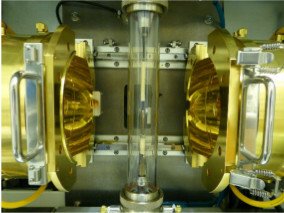 Much of the synthesis of single-crystals will be carried out at Warwick whose Superconductivity and Magnetism Group in the Physics Department has excellent facilities for research into skyrmionic materials. Warwick is well-known for the growth of high-quality single-crystals of oxides, intermetallics and related materials, with over 50 national and international partners engaged in this work. It is equipped with three optical mirror furnaces (including one with Xe arc lamps which uniquely allows us to reach temperatures of up to 2800° C), a tetra-arc furnace, as well as facilities for crystal growth by the Bridgman method, the flux method, and chemical vapor transport. The different optical furnaces provide a range of preparation conditions allowing us to vary, for example, the temperature definition in the molten zone and the growth rates. Once single-crystals are produced, the real-time x-ray Laue back reflection system will allow fast, direct examination of the quality of the as-grown crystals and the alignment and cutting of samples. Polycrystalline samples of new and interesting materials will be prepared using a suite of box and annealing furnaces. Structural studies will include x-ray diffraction and electron microscopy. Powders can also be analyzed using thermogravimetric and differential thermal analysis. Optical mirror furnaces We will employ either the Floating Zone(FZ) or <>Solvent Floating Zone (TSFZ) techniques. A wide variety of systems, which have both congruent and incongruent melting points can be prepared using these methods. Different growth atmospheres and pressures can be used. A wide variety of oxides as well as intermetallic materials can be produced as crystals using this technique. (e.g. a sealed quartz ampoule or a boron nitride crucible) and cooled from the molten state through a temperature gradient. For crystals that cannot be obtained from molten material, the chemical vapor transport (CVT) technique may be used. This is the most popular technique to obtain several skyrmion materials. Here, the material is mixed with a transporting agent (such as iodine or chlorine) and placed in an evacuated sealed quartz tube. A furnace with several temperature zones is used to transport the material to a colder zone where it is deposited as crystals. These growths typically last for several weeks for each growth, and the growth periods and conditions have to be optimized for each material. Schematic of the 2-zone furnace used for the chemical vapour transport technique. 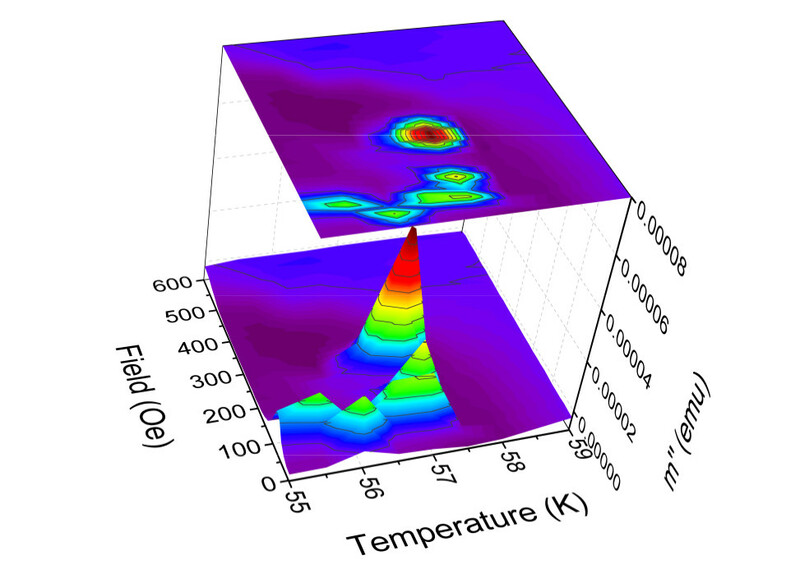 AC susceptibility measurement of Cu2OSeO3 showing the skyrmion phase.